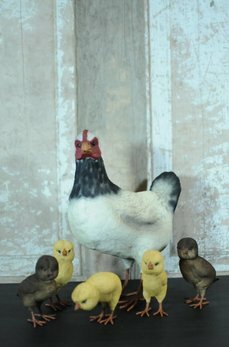 The Farm Black & White Hen with Baby Chicks is stunning! Made with paper mache, 100% with the Craig Yenke's hands. Craig is inspired by hand mades from Germany more than 2 centuries ago. No molds or pre-made pieces were used. 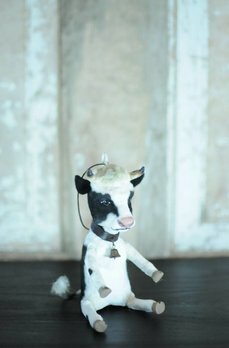 The Cow Handmade Ornament is made with paper mache, 100% with the artist's two hands. Craig Yenke is inspired by art from Germany more than 2 centuries ago. No molds or pre-made pieces were used. This art is stunning! 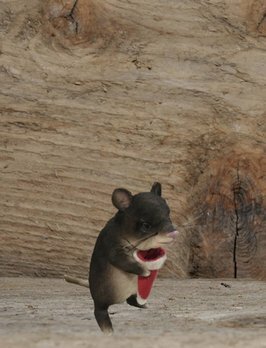 You'll love the realism of the Christmas Mouse with Santa Hat. The details are amazing, all made with paper mache. Artist, Craig Yenke is inspired by hand mades from Germany more than 2 centuries ago. No molds or pre-made pieces were used. Cardinal Male Bird by C. Yenke Co. The Cardinal Male Bird is made with paper mache, 100% with the artist's two hands. Craig Yenke is inspired by hand mades from Germany more than 2 centuries ago. No molds or pre-made pieces were used. This art is stunning! 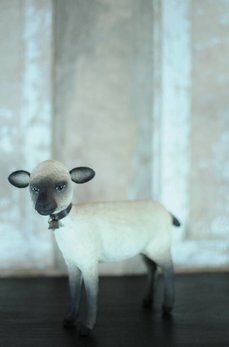 The Handmade Lamb, standing, is made with paper mache, 100% with the artist's two hands. Craig Yenke is inspired by hand made pies from Germany more than 2 centuries ago. No molds or pre-made pieces were used. This art is stunning!